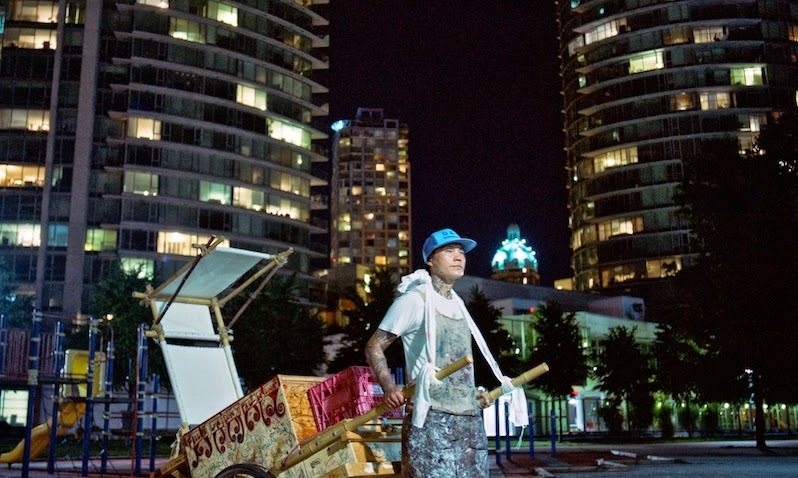 One can either embrace change or one can fear it, and Everything Will Be takes viewers on a tour of Vancouver’s Chinatown and introduces them to a cast of residents who reflect on the gentrification of their community with a mix of excitement and trepidation. The film observes long-time residents, mostly shopkeepers, including one ninety-year-old woman who vows to run her newspaper stand until the day she dies. Mahjong tiles continue to flow, pork buns continue to steam, and grocers continue to tell familiar patrons to pay the rest of their bill "whenever they have the money." A unique character survives in the aged residents of Chinatown as they continue to thrive in the ever-growing shadow of gentrification. They can either watch Chinatown change or they change with it, Kwan’s poetic observation seems to say, but embracing the new isn’t nearly as easy as some of Chinatown’s newest residents believe. The tension between the old and the new is perhaps best expressed in a storyline that features a starving artist named Ken who introduces the film to the one-month anniversary of his new Chinatown gallery. Ken is one of the newer residents on the strip, but his eclectic art space unites the old and the new of Chinatown by infusing old traditions with hipstery twists like hanging a rubber duck in a birdcage outside the shop to honour the practice of putting songbirds in the windows. There isn’t much business coming Ken’s way, though, as the hilarious security guard who serves as a conduit/tour guide for the audience observes while exploring some of Ken’s funky work. The gallery is too trendy for the Chinatown veterans, but it’s too far off the beaten track for arty yuppies. The gallery shows the awkward struggle of bringing the new into a community with vibrant cultural heritage and rich roots. Seeing the artists flock to Chinatown—there are ample galleries popping up between teashops and grocery stores—hints at the greater cultural shift in the transition of the urban space. “Follow the artists and prostitutes, and you’ll see where the city is moving,” says museum owner Bob Rennie during a visit to Ken’s gallery. Bob is at the forefront of balancing Chinatown’s transition, as Everything Will Be shows him developing a remarkable museum that infuses the old with the new, as he fashions a decidedly contemporary space within the walls of Chinatown’s oldest building. Bob, however, shows a deep appreciation for the legacy of the bygone Chinatown, as the exposed brick and collected artifacts within the walls of the museum demonstrate how embracing change doesn’t necessitate a death of tradition. “Everything is Going to Be Ok,” champions the neon light adorned atop Bob’s museum, and the funky light enjoys a presence in Everything Will Be that is both ironic and optimistic depending on the viewpoint(s) within which Kwan frames it. The title itself derives from Bob’s ever-present signage, but the abbreviation of the phrase, the removal of the affirmation, leaves it up to viewers to decide whether one should embrace the changing cityscape. On one hand, a tangible character thrives in Chinatown that one doesn’t find anywhere else and it is present in every discussion with the elderly patrons and in every cutaway to the meticulously detailed fixtures of the vacated buildings. The cinematography by Patrick McLaughlin draws out the vibrancy of Chinatown with deep reds and blacks, while Kwan and her team frame Chinatown amidst an aggressive wall of high rises that rapidly encroaches upon this space. On the other hand are residents like Free Lee who infuse new, hip practices with notes of tradition. There is the possibility for something fresh and exciting to be had amidst all this change. The condos need not represent a Northrop Frye-ish hostile environment; perhaps they’re giving new life to this community. Most surprising, though, is a candid moment with one of Chinatown’s longstanding members, Olivia, who voices the futility of resisting change. Olivia, who closes up her family teashop even though it was the first in the city, remarks that legacy is ultimately a redundant concept. People come and people go, so where one does one’s business is irrelevant. It’s ultimately a question of how one conducts one’s business that Kwan seems to be getting at, for the endurance of a character and of a communal spirit can make the transition worthwhile. This exquisitely shot and carefully crafted film is both an ode to a bygone era and a forward-looking snapshot of a world in transition.